The Really Good Japanese Place Is Finally Revealed! 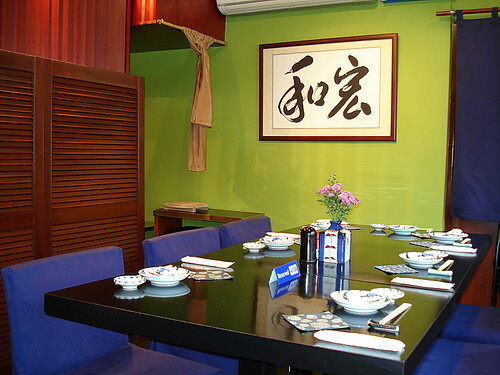 Dining interior - this table is always reserved!, originally uploaded by Camemberu. Yes. Yes. 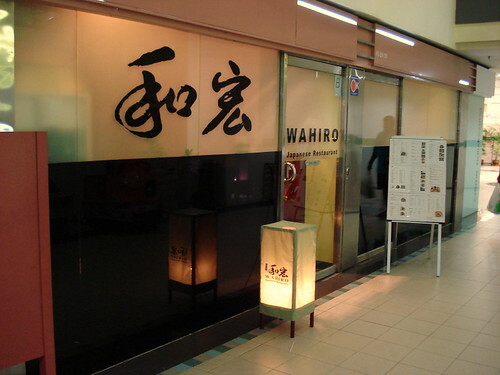 The mystery Japanese place I blogged about earlier is Wahiro at Katong Mall. Some of you may have guessed it already, some of you may even have already eaten here but a few might be going "Huh, Wahiro? What's that?" Wahiro (meaning "Great Harmony") is actually an open secret. It has no lack of customers and I hear Japanese chefs from other restaurants come here to dine. This little unassuming joint helmed by a former Suntory chef can easily be missed from its very simple frontage, but the aroma of grilled meat wafting in the air will be unmistakable. Just next door is sister restaurant Kushiyaki which delivers all these grilled items that you can order from Wahiro as well. 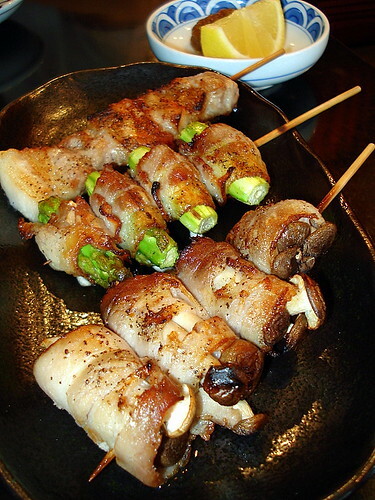 From front to back - shimeji bacon, asparagus bacon, buta bara (pork belly) kushi, originally uploaded by Camemberu. Dinner tonight yielded the usual goodies - kushiyaki (grilled skewer items) generally meeting expectations. Tamago Bacon Kushi, originally uploaded by Camemberu. We tried a few new items. 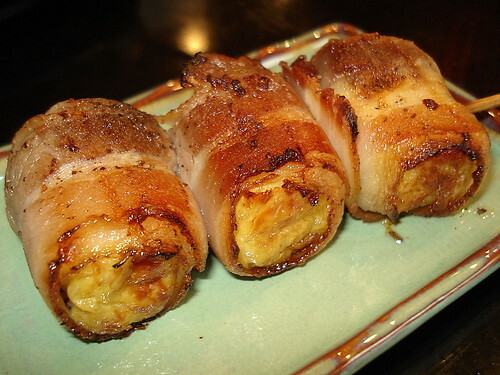 I quite liked the tamago (omelette) wrapped in bacon. Eggs and bacon are always a good pair, don't you think? 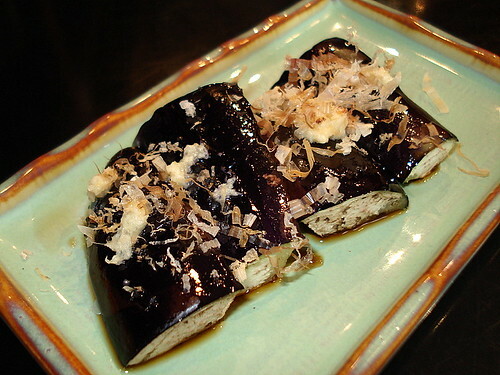 Nasu (eggplant) kushi, originally uploaded by Camemberu. The grilled eggplant came doused with soy and had bonito flakes scattered on top, doing their little dance. 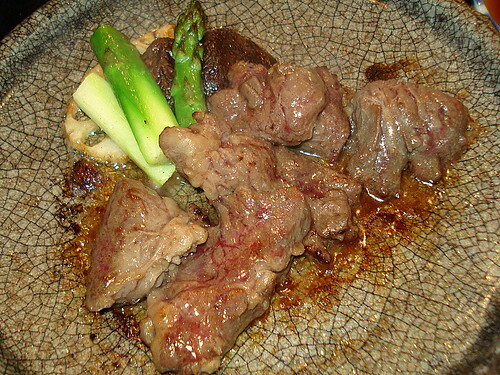 However, it still tasted bland - I think nasu is still best grilled dengaku style, with miso, until it's really soft. This one still had some raw bite to it. Beef Touban Yaki, originally uploaded by Camemberu. Now this dish came sizzling and smelling like buttery wagyu heaven! I thought we were in for a treat, but for some bizarre reason, the pieces of beef had no taste! It was soft like very fatty beef but slightly rubbery despite not being overcooked. Very puzzling but this was the first disappointing dish we've found here. Not worth the S$24. Curry buns, originally uploaded by Camemberu. Ironically, hubby's favourite item tonight is the most un-Japanese of all the dishes we had. Curry buns. I couldn't believe it when I saw this item on the menu, looking so out of place. 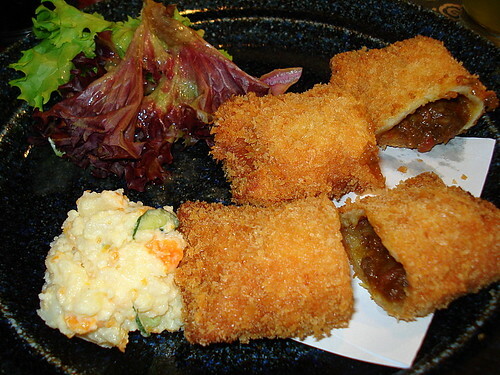 Japanese-style curry beef encased in dough and deepfried with breadcrumbs. Even comes with Bulldog sauce. A tad greasy but tasty. Yaki Onigiri, originally uploaded by Camemberu. 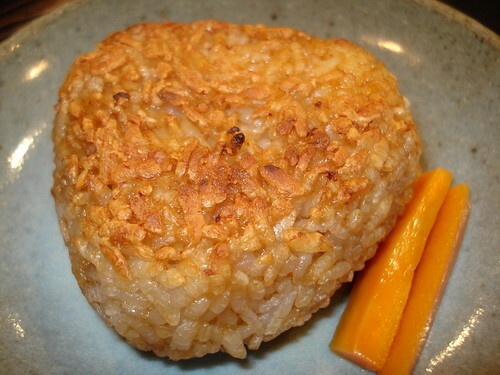 I love onigiri and when grilled, they taste even better - like the charred rice bits at the bottom of claypot rice. I have to say this one is quite well-done here. Grilled crispy and salty on the outside but soft and chewy in the centre. 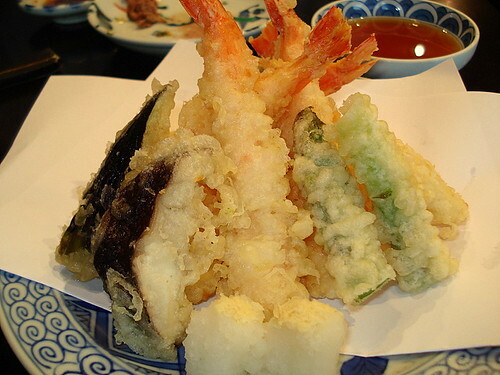 The tempura moriawase is always worth having. However the price has gone up since my last visit - from S$9.80 to S$12.00! But still good value. Simple and humble shopfront, originally uploaded by Camemberu. Wahiro is also well-known for its innovative omakase and seasonal kaiseki courses (check the website for updates). Have not tried any of its sashimi or sushi offerings (I hear it's generally good but can be occasionally erratic) but there are plenty of choices here even if you don't like raw stuff. It also serves set lunches at S$15. Dinner sets run about S$30. Reservations recommended. Now, don't everybody go there at the same time! I guess "curry buns" is Curry-pan(curry in a bread) in Japanese. Bread is imported foods in Japan, but curry-pan was developed by Japanese. It is so popular in Japan, particularly kids loves it. check this if you are interested. This place looks like a nice place for Jap! Your blog looks very very delicious too! ok... I must visit this place someday very soon! I was right I was right I thought it was Wahiro!! Hi Taro! Yes, it does sound like curry-pan! Bun also means bread, so it makes sense. Keropok man, thanks for visiting too! Liveyrdream, ah yes, Werner's is nice. Hope you get to try Wahiro soon! hey, mind sharing how much the kushiyaki items cost? i'd love to try this place out, thanks! Hi anon, the kushiyaki items at Wahiro that I had range from S$2 (vege) to S$5.80 (meats) thereabouts but some of the skewers come in pairs, unlike at Kazu where prices are all per stick. Wahiro also has some more expensive stuff like scallops at S$9 or so. Sorry I can't remember exact prices! Ice: Bulldog sauce is a tonkatsu sauce. See this link for pic. You can get it at most supermarkets. Order the sushi set and it came with thickKKK fishes on smallllll rice ..haha, totally opposite that of kikuzawa. But the curry rice buns, the prawncakes, was disappointing. Wow, that food looks good!!! anyone can confirm it and if standards the same? Yes I think I saw a poster at Wahiro Katong that says they have a new branch there. But not been to the new place personally. Anyone? May I ask what is available for their set lunch? It's a mix of things - probably like what you get in a bento - bit of sushi, tempura or fried item, steamed/boiled item, noodles or rice. I should like to try it someday. Will blog about it if I do. Sounds interesting. Thank you for the reply.